Yesterday I shared my version of Blue Heaven’s Banana Bread. 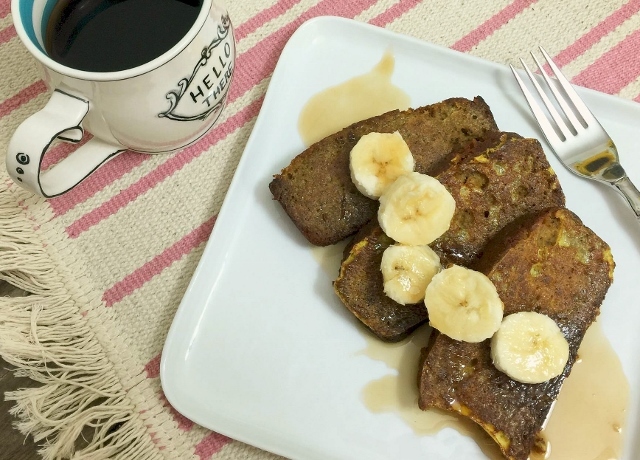 Today I’m sharing with you my recipe for Banana Bread French Toast, made with that very same banana bread. I hope you baked a double batch! 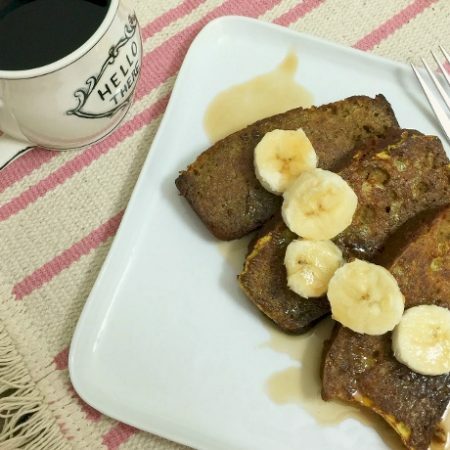 When I made this and served it for breakfast, my favorite fella asked if I remembered where he had eaten Banana Bread French Toast. Somewhere in our travels, he had indulged in this before. We still haven’t figured it out. I’ve made two batches of this French toast just to make sure the recipe was solid. We’ve discussed this each time we are indulging in this, yet neither of us can remember where he ate this. It wasn’t at Blue Heaven, the funky spot in Key West that inspired the banana bread. Then we thought maybe it was at the Sea Porch at the Don Cesar in Florida. This seems like something they would offer, but alas it wasn’t there. I spent far too much time searching the interwebs trying to figure out what restaurant we have visited that actually serves this. The only one I could find was Watercourse in Denver, but we’ve never been there for breakfast. It will continue to be a great mystery. Don’t lose any sleep over this, okay? I’ll figure it out one of these days. Bake bread one day in advance, allowing to cool completely. Slice into eight slices. Heat griddle over medium heat until warm enough that a drop of water will skittle across the surface. Add just a touch of oil of your choice. I use coconut oil spray. Gently dip a slice of the banana bread into the custard mixture, flipping to fully coat both sides. Place on griddle. Cook for 1 1/2 to 2 minutes, until lightly browned and the custard is set. Then flip and cook on other side. Repeat for the entire loaf. I am linking this post up with Gluten-Free Wednesdays and Allergy Free Wednesdays. Click over for many more recipes sure to make your mouth and tummy happy! Oh my gosh, Johnna, we were JUST talking about making Banana Bread French Toast! It’s such a brilliant idea, don’t know why we haven’t done it before! Can’t wait to try your version! This looks fabulous! 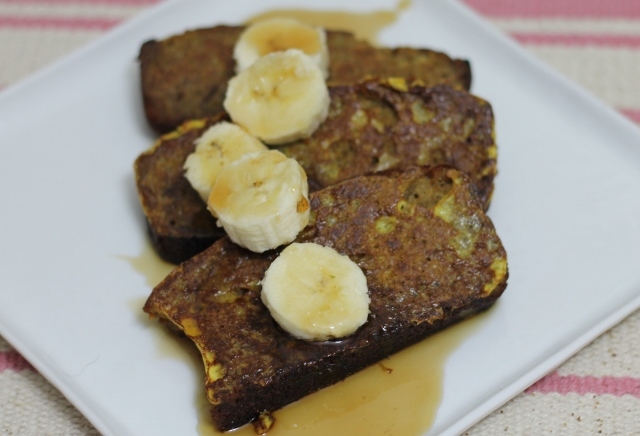 I so want to make french toast with banana bread! Since I don’t eat eggs, I’d just use more mashed banana as the “egg dip”! Mashed bananas as egg dip?!?! That is brilliant! Isn’t that a brilliant idea? Thanks for sharing that, Rebecca! Thank you. And what a terrific idea to use mashed banana as the egg dip. Thank you for sharing that! I love french toast! I must try this soon! I hope you will. It’s so good! I love banana bread and I love french toast. I can’t believe I never thought of combining the two ideas 🙂 Sounds amazing! And I’m still trying to figure out where we saw this served. 🙂 It is a great combination of goodness.